While not as prolific as they were just a few years ago, the Rams under offensive coordinator and head coach Mike Martz were maybe the best passing offense of all time. They set a gazillion scoring and passing records, and now teams like the Chiefs and Cardinals run their offense verbatim and others like the Bengals run extremely similar schemes. The offense itself goes way back to the Don Coryell and Sid Gillman days, as interpreted by guys like Ernie Zampese and Norv Turner. The vertical passing game is well documented and very important (in fact they run the 3-vertical I link to in the previous post), but the shallow cross has been a great tool for them to hit passes underneath the fast dropping linebackers and to get good matchups with speed receivers getting rubs and running away from man to man for big play potential. The Rams integrate the shallow cross into four main concepts: drive/cross-in combo (same side), hi-lo (shallow/in opposite sides), mesh, and the choice. 1. First step is directly upfield. Vs. press man stutter step and get inside position. 2. Rub underneath any playside receivers inside of you. 4. Cross center. Aim for 5-6 yards on opposite hash. 6. Vs. zone settle in window facing QB past the center-line (usually past the tackle). Get shoulders square to QB, catch the ball and get directly upfield. 7. Vs. man staircase the route (shown above, push upfield a step or two) and then break flat across again and keep running. No staircasing when running mesh. Reading man or zone: After your initial step, eye the defenders on the opposite side of the centerline. Two questions: who are they looking at? and what does their drop look like? If they are looking at the receivers releasing to their side and turning their shoulders to run with those receivers, it is probably man (on mesh look if they are following the opposite receiver). If they are dropping back square and looking at either the QB or at you, it is probably zone. Expect to settle. Even if it is zone and there is nothing but open space, keep running; we'd rather hit a moving receiver than a stationary one. Now, onto the concepts themselves. This is the most versatile of all the shallow-cross routes, and my personal favorite. The in route is run at 14-15 yards (can shorten to 10-12 for H.S.) and the corner is a 14 yard route (can also be shortened to 10-12). The Rams typically use two different reads on the play, depending if it is man or zone. Against man the read is shallow->in->corner (RB dump off). Against zone it is a hi-lo: corner (or wheel), in, to shallow. 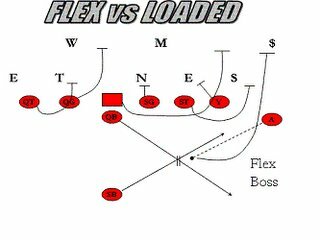 The shallow and sometimes a quick flat are good options built in against blitz, and the play can be run from many formations, including the bunch. Below are some variants. On the right, is incorporating an angle route into the play, and it always gets read inside to out. On the left, the play is run from a balanced one-back set, and the backside can have almost any two-man combination used. Below the smash is shown, but it could be curl/flat, out/seam, post-curl, or any other combination. Typically a pre-snap or post-snap determination can be made based on man/zone or whether the coverage rotates strong. The hi/lo shallow concepts is similar to how Texas Tech/Mike Leach and the other Airraid gurus run their shallow series. For more info, try the link. Below is what the Rams do. The in route is at 15 yards as is the post route. Both can be shortened to 10-12 for lower levels. The frontside corner is run at 15 and is only thrown vs. certain man looks. Also, versus quarters coverage the Rams like to look through the In to the Post route. The idea is that if the safety jumps the In they can hit the post up top behind him. Typically the weak safety (to in/post side) is watched on the early part of the drop, and if he comes up for whatever reason (probably to cover when a blitz is on!) the post becomes the #1 read. The pass on the right is read the exact same, just some of the responsibilities are switched. The mesh route has extensive literature and discussion on it and the intricasies of the meshing receivers can be found elsewhere. The basic gist is that two receivers cross over the middle getting a rub, which is very effective versus man. Sometimes it also can be a horizontal stretch against zones with four underneath men. Martz has adjusted the play so instead of a frontside corner hi/lo read or even a post to take the top off like Norm Chow likes, he has the Z receiver running a curl at 12 yards over the center. What happens then is it floods the underneath zones with four defenders to cover five receivers, just like on all-curl. So it is a very effective man and zone play. Also, almost always at least one of the two receivers threatening the flats will run a wheel route, giving a deep option. The QB will get a pre-snap read for the wheel route, basically checking to see if a LB has him in man and/or if the deep defender to that side might squeeze down with no immediate deep threat. The read is then right to left, X-Z-Y, or shallow, in, shallow. Again, as before, the shallows will look to settle vs. zone but they need to get a little wider here. Also, as explained elsewhere for the mesh the Y sets the top of the mesh at 6 yards and X comes underneath at 5. It is best if they can cross going full speed, but must navigate the LBs and undercoverage (and the ref!). If all is covered vs. zone the ball can be dropped off to the flat to the RB or tight end/H-back. The Rams call the play with numbers and will tag either the post/middle read or the shallow so I'm not sure what they call it, but the play is adapted from the old run and shoot choice route. The choice route has been successful for teams for years, and the Rams are only happy to incorporate its concepts. However, while the choice is typically read from the single receiver side over, the Rams read it opposite, with the single receiver side the late read and the middle-read the primary. The play is really intended as a spring to a slot receiver or RB in the seam with the ability to read on the fly. They change the reads up for the post/seam pattern here run by F and H, but essentially it is similar to the middle read on the 3-vertical play, where he reads MOFO or MOFC and looks to attack the deep middle against open coverage and break flat across underneath a deep middle safety. The Rams also give him the option to break it off against blitzes and, in the case of getting H out in the second diagram, versus "wide" coverage (i.e. a LB squatting outside waiting for him to go to the flat) he can stick it at the LOS or just beyond and run an angle back inside (it helps to have Marshall Faulk!). The read is post-read->shallow->comeback/flat read. So if they squeeze the post-read the shallow is next and then the QB works the comeback and the flat off a hi/lo read. In the second diagram the seam just clears out or breaks off his route if there is a blitz. I suggest against having hot reads and sight adjustments to both sides combined with a multi-direction read route unless you are the St. Louis Rams. It is still an excellent play if you keep at least 6 in to block and let the shallow be the hot read, or you can even run it as a 7 man protection if you take away the backside comeback route. That's a brief overview of the various ways they go about it and the reads. A HS team needs one, maybe two ways of doing this. Lots of teams have been successful using some of these. Florida State won a championship and Charlie Ward a Heisman trophy running the drive version, where if the D dropped off and covered the shallow, swing, and curl, he ran a draw. All of these are high percentage throws. Remember: speed in space! It's a motto that scores points and wins games. Just wanted to mention that I watched the bowl game between Arizona St and Rutgers, and Arizona St used the 3-vertical play at least 10 if not 15 times. Rutgers runs a lot of Cover 2 (HC Schiano came from Miami where he did the same thing) and this is maybe the best play against it. They ran it from all kinds of sets, from gun, with play action, etc. ASU racked up over 600 yards of offense and I swear at least 200 or 250 and several TDs came off this one pass play. Check out this old article I did on the play here. We are going to try to take advantage of what the other team is doing on defense. During the course of a game, with the sophistication of defenses, coverages are disguised and the use of zone blitzes and fire blitzes become very hard to beat. We’d be lying if we said we sat up in the box and knew what coverages were being run. What we try to do is take a portion of the football field, the weak flat for example, and we will attack that until we can figure out what the defense’s intentions are. Then we try to attack the coverage that we see. It is very difficult to cover the whole field. We are not going to try to fool anybody. We are going to take little portions of the field and try to attack them until the defense declares what it intends to do. That is wisdom right there. First, to admit that you can't stand back and make magical judgments about what the defense is doing or what its intentions are. Second, the proper response is to try to turn the game into something manageable--i.e. attacking these "portions" of the field with mirrored reads, flood routes, etc. Number one, we are going to protect the quarterback. If you decide to rush seven, we will block seven. If you decide to rush 10, we will try to block 10. We are going to try to protect the quarterback. Lance and Roger spend a lot of time picking up blitzes and that is the basic tenet that we have. You may be better than we are, but schematically we will try to protect the quarterback. How often is this forgotten! I am a spread guy, I have roots of the pro-spread, the run and shoot, and there is a fact that the defense can always bring one more than you can protect, but protection first is the proper mindset. Hot routes are not what you build your offense on and you do not declare that you are a four wide team and that this fact is immutable. You have the ability to adapt to different defensive responses and protect your kid back there who is trying to find receivers without getting his head taken off. 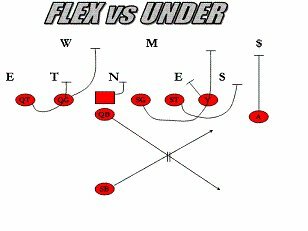 I'm pretty swamped the next couple of weeks, so I'll do the "lazy blogger" technique and post some links and info, this time all about the Airraid offense, in honor of the Mike Leach article that came out yesterday. If you want to learn more I suggest checking out the Valdosta St/Chris Hatcher tapes on the Airraid offense and routes for the Y receiver/tight end. Remember, they got much of their offense from BYU's offense from the 80s and, even today has lots of similarities with what Norm Chow did at BYU, NC State, and Southern Cal. Norm Chow - BYU Passing Game Article - Great Article! 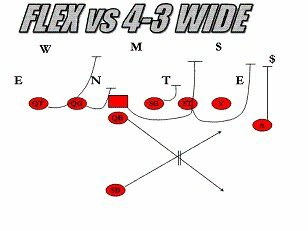 Last, here are Norm Chow's reads for his passing plays (see the Chucknduck link for quick reference to diagrams). The reads for the Airraid are very similar, if not the same in all respects. “61 Y OPTION” – 5 step drop. Eye Y and throw it to him unless taken away from the outside by S/S (then hit Z), OR inside by ILB (then hit FB). Don’t throw option route vs. man until receiver makes eye contact with you. Vs. zone – can put it in seam. Vs. zone – no hitch step. Vs. man – MAY need hitch step. “62” MESH – 5 step drop. Take a peek at F/S – if he’s up hit Z on post. Otherwise watch X-Y mesh occur – somebody will pop open – let him have ball. Vs. zone – throw to Fullback. “63” DIG – 5 step drop and hitch (7 steps permissible). Read F/S: X = #1; Z = #2; Y OR HB = #3. “64” OUT– 5 step drop. Key best located Safety on 1st step. Vs. 3 deep look at F/S – if he goes weak – go strong (Z = #1 to FB = #2 off S/S); if he goes straight back or strong – go weak (X = #1 to HB = #2 off Will LB). Vs. 5 under man – Y is your only choice. Vs. 5 under zone – X & Z will fade. “65” FLOOD ("Y-Sail") – 5 step drop and hitch. Read the S/S. Peek at Z #1; Y = #2; FB = #3. As you eyeball #2 & see color (F/S flash to Y) go to post to X. Vs. 2 deep zone go to Z = #1 to Y = #2 off S/S. “66” ALL CURL– 5 step drop and hitch. On your first step read Mike LB (MLB or first LB inside Will in 3-4). If Mike goes straight back or strong – go weak (X = #1; HB = #2). If Mike goes weak – go strong (Y = #1; Z = #2; FB = #3). This is an inside-out progression. NOT GOOD vs. 2 deep 5 under. “67” CORNER/POST/CORNER ("Shakes") – 5 step drop and hitch. Read receiver (WR) rather than defender (Corner). Vs. 2 deep go from Y = #1 to Z = #2. Vs. 3 deep read same as “64” pass (Will LB) for X = #1 or HB = #2. Equally good vs Cover 2 regardless if man OR zone under. “68 SMASH” SMASH– 5 step drop and hitch. Vs. 2 deep look HB = #1; FB = #2 (shoot); Z = #3. Vs. 3 deep – stretch long to short to either side. Vs. man – go to WR’s on “returns”. “69 Y-CROSS/H-Option – 5 step drop - hitch up only if you need to. Eye HB: HB = #1; Y = #2. QB & receiver MUST make eye contact vs. man. Vs. zone – receiver finds seam (takes it a little wider vs. 5 under). Only time you go to Y is if Will LB and Mike LB squeeze HB. If Will comes & F/S moves over on HB – HB is “HOT” and will turn flat quick and run away from F/S. Otherwise HB runs at his man to reinforce his position before making his break. That should give plenty of insight into the Airraid! If you want to learn more than this, contact Texas Tech and/or Valdosta St. Both are quite generous with their time (I think Leach even has a session for HS coaches in the sprin). The best (and some might say only) way to learn an offense is to visit and watch them put it in. Additional materials would be the Valdosta videos, and actually Norm Chow has a great video floating around about his offense, from back in the BYU days. The most important area for determining secondary coverages is the middle of the field about 15 to 25 yards deep and about 2 yards inside of each hash. We call this area the “square”. We normally read the “square” in our drop back passing game. Reading the “square” becomes necessary when it is impossible to determine what the coverage they are in before the snap or to make sure of secondary coverage after the snap. In reading the “square” the QB simply looks down the middle of the field. He should not focus on either Safety but see them both in his peripheral vision. A) If neither Safety shows up in the “square”, and both are deep, it will indicate a form of Cover 2. A quick check of Corner alignment and play will indicate whether it is a 2/Man or 2/Zone. If neither Safety shows up in the “square” and both are shallow, it will indicate a Cover 0 (blitz look). B) If the Strong Safety shows up in the “square”, this will indicate a Cover 3 rolled weak or possibly a Cover 1. C) If the Weak Safety shows up in the “square”, this will indicate a strong side coverage. It could be a Cover 3 or a Cover 1. If the coverage is Cover 3, it could be a Cover 3/Sky (Safety), or a Cover 3/Cloud (Corner), depending on who has the short zone. NOTE: When either of the Safeties shows up in the “square”, the best percentage area to throw the ball in is the side that he came from! If NEITHER of the Safeties show up in the “square” – throwing the ball into the “square” is a high percentage throw. I got this from, guess who, Bill Mountjoy. The Colts and their offense are constantly being discussed. Obviously, they have great personnel with four very good receivers including their tight end, one of the best single backs in the league, and a $60 million quarterback to put them in the correct play every down. However, it is still worth analyzing a bit what they do. Their favorite run play is the stretch play, also known as the outside zone. They are also extremely effective at play action passing off the stretch action, where Peyton Manning makes those great run fakes that the announcers go crazy about. (From what I can tell their favorite routes from their play action from the stretch are post/dig, double posts, and post/corner/post combinations). Anyway, they run their stretch a bit differently, since instead having everyone step and reach playside and getting movement that way, they run a kind of "pin and pull" scheme, which at the college level the Minnesota Golden Gophers also run with great success. The diagrams/explanation is not directly from the Colts but it is what they do. FLEX is a strong side play. The aiming point for the Single Back is 1 yard outside of the TE. If the “A” is play side he is responsible for blocking the force (strong safety) defender. If the “A” is in motion prior to the snap and we want him to block the force defender on the play side we will call FLEX BOSS. If the Center can reach the Nose he will make a “YOU” call to the Strong Guard telling the Strong Guard to pull and block the M(ike) linebacker. The Strong Tackle and Tight End will “TEX”. The TE must block DOWN and not allow any penetration. The Strong Tackle needs to pull and RUN TO REACH the S(am) linebacker. If the Center cannot reach the Nose he will make a “ME” call to the strong guard telling him to block the Nose and the Center will pull to block the M(ike). The Strong Guard must block DOWN and not allow the Nose to penetrate. The Strong Tackle and the TE will “TEX," as described above. The Tight End is responsible for blocking the DE wherever he aligns. The Strong Tackle is responsible for pulling and blocking the SLB’er wherever he aligns. Stay square and see the Sam linebacker during the pull. The Center is responsible for blocking the Mike linebacker. The Quick Guard has a difficult block and must be prepared to SCRAMBLE block the Nose. The Tight End is responsible for blocking the DE wherever he aligns. STEP-CROSS-STEP to reach the DE. The Strong Tackle is responsible for pulling and blocking the Sam linebacker. Stay square and see the Sam linebacker during the pull - you could go around OR inside of the TE’s block. The Center is responsible for blocking the Mike linebacker & the Quick Guard blocks the Nose. Charlie Weis - Run and Shooter? Obviously Charlie Weis is not a run and shoot coach, and, having studied some of his New England stuff it does not really resemble much of the run and shoot packages. The more likely theory that his offense is sort of an amalgamation of common and traditional NFL tactics. Do it simple; do it well. Coach Mountjoy has pointed out some of the evolution in his offense that began when Weis coached with current Carolina coordinator Dan Henning, but I am not an expert. Q. Coach, after watching Saturday, this question begs to be asked: Did your career path ever intersect with Mouse Davis? COACH WEIS: I did visit with Mouse Davis back in South Carolina when we had the run and shoot. We talked to Mouse Davis, we talked to John Jenkins not Father John Jenkins, by the way Mouse Davis, John Jenkins, those run and shoot guys. Yes, we went from the veer to the run and shoot at South Carolina. We spent some time with all of those run and shoot guys. Q. Was influences of that evident on Saturday? COACH WEIS: No. What you saw Saturday [ND did a lot of 5 wide stuff and quick three step passes], first of all, run and shoot always has a back in the backfield. It's either a two by two or three by one, which trips are spread; okay, that's number one. And you always have a run element, so empty (backfield) really doesn't come into play. If you talk about the look passes [the one step hitch] and swings that we throw in the game, that's just an evolvement from check with me(s) that we've been running over the years. I would not have thought that Weis had been involved with "the shoot," but it isn't susprising that he is well versed in lots of football offense. While studying the Run and shoot won't give you much insight into what Weis is doing now, it's still a sophisticated offense and an understanding of the run and shoot, why it worked so well and for so long, and some of the defensive reactions and reasons why it isn't as popular anymore (though most of the diehard shooters will tell you it is simply from a lack of commitment) is as good an introduction into the passing game and modern football as you're going to get. Further, the first time I coached on a pass-first team was with a run and shoot squad: I coached receivers, slotbacks, and defensive ends (outside linebackers) on a small squad. The best run and shoot resources are Al Black's book, listed on the right side of the menu. The chucknduck site has diagrams of the 6 main packages vs. the relevant defenses. Tommy Browder has a website with diagrams and explanations of the tradition R&S pass protection, screen game, etc (note the midi that plays when you go to it, I think that website is or is getting close to 10 years old). Footnote: the "go" with its "middle read route" has become, in various forms, a staple of nearly every offense, and "the switch" is still maybe one of the most explosive pass plays you can put in. Ironically, the most vivid recent memory I have of "the switch" is that in the Super Bowl that the Rams lost to the Patriots, the Rams' TD that put them ahead to set up Brady (and Weis's) game winning field goal drive was a touchdown pass to Ricky Proehl on, you guessed it, the switch. Mumme isn't having a wonderful season right now in his first season back in D-1, but it will give you pause to think that four offensive coaches from the 1997-1998 Kentucky staff are all Head Coaches: Mumme himself, Mike Leach at Texas Tech, Guy Morris at Baylor, and Coach Hatcher at Valdosta St. D-II (who is having arguably the best success of them all with a Nat'l title and currently undefeated). Lots of coaches who email me and contact me ask about the passing game, and probably even more important than schemes are how to install it and practice it. This is one of the best explanations I've come across. If you want to install the Airraid offense I would suggest buying the Valdosta tapes where they discuss drills and plays, using this practice plan, and contact the Texas Tech staff about visiting their spring practice and/or discussing football with them. You'll learn quite a bit. (Also, from what I understand BYU is basically running a form of the Airraid now, since their OC was from T. Tech). Practice schedules and drills for the pass offense are not a lot different than those for the conventional offense but I believe a great deal of thought and preparation must be done to achieve success. 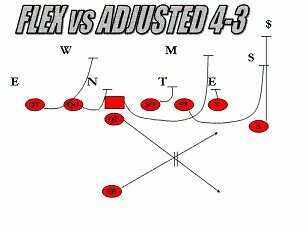 In the “Air Raid” offense I have used for many years at several different levels certain nuisances have lent themselves to practicing well. I will detail these things in the article with hope it will help you. The pass offense depends much on timing and chemistry between players i.e. QB and WR on route, this makes consistent practice a must. I always tried to erase doubt in the players’ minds as to what would be done in practice on any given day. I endeavored to make all the Mondays the same, all the Tuesdays the same, etc. By keeping a consistent practice schedule through each game week of the season our players could gear up mentally for the tasks to be accomplished in each segment of practice. To give an example, our individual drills were all done the same way and same segment of each day's work out. Consistent practice makes for consistent reps, which make for great reps, which makes for great play. That old saying about you play like you practice is true. It was always my belief that five great reps of anything were worth more than ten mediocre reps. With this in mind, I encouraged our players to slow down their reps but to do them great. For example, if you have a QB and two WR working on the curl route don’t rush through the drill just so you can say you got ten reps. It will be a lot more productive to have the WR walk back between reps, take there time, and have five great curl routes each one perfect. Hustle is fine but is not the only ingredient. Practice successful reps even if it means fewer reps. I never wanted to practice anything that a player could not visualize doing in a game. The successful coach should look at every drill - be it individual, group, or team type - and ask himself if this will happen in a game. If this answer is no, throw it out, it is wasted motion, which means lost time. The only resource that cannot be replaced is time. Knowing you can eliminate poor drills, look at the fruitful drills. Take each one and study how you can make them more game-like. For example, our “Air Raid” offense depended greatly on multiple sets, player groupings, and the no huddle attack. With those parameters, I decided to make all of our team offense drills more game-like by having the sideline coaches and players box painted on our practice field and requiring all our coaches and players to work and sub from where they would in the game on Saturday. This greatly enhanced the efficient use of subs and made delay of game penalties unheard of in our offense. I believe players will perform better in games if they can visualize what it will be like therefore practice game-like events. Every coach loves that play which happened just the way he drew it up. To be honest about it though, those are more rare than ordinary. This is particularly true in the pass offense. Practicing contingency football is very important. I would take each of our pass plays and draw up what would happen if our QB were forced to scramble to his right and then repeat the process with a scramble left. I would drill this about ten minutes per a week to make sure everyone knew where to go on the field if the QB scrambled right or left. I had landmarks for each receiver and the offense of line and running backs had specific duties. Our teams often made spectacular plays when the opponent’s defense played its best and forced our QB from the pocket. We turned our lemons into lemonade so to speak because we practiced the unplanned event. Practice Organization is crucial to having an effective multiple receiver pass attack. Scores happen because players expect them to take place. I have certain things I want accomplished on each play from each player but the bottom line is to score. With that in mind, I made it mandatory that whomever ended up with the ball on any play had to cross the goal. In other words, our players scored on every play in practice, from individual drill right through team. I wanted all of the players to expect to score on every play. This takes some patience since the coach has to give the ball carrier time to return from the sprint to the goal. The results are worthwhile, as big plays can become habit. All the practice habits described can be planned into workouts. The best time to plan workouts for the season is in the summer when the pressure is off. For this reason all of the workouts for the entire fall including bowl games or playoffs I planned in July. They were organized by day of the week and placed in a large binder to be used as needed on a daily basis. It was always amazing how few changes had to be made and how consistent our offense would become due to this planning. The most important time during the game week are the moments coaches spend with their players. By not having to devote daily time to planning practice schedules the coach has more time to spend with the players. Success can be planned well in advance.